SURGIDERO DE BATABANÓ, Cuba, Oct 22 2013 (IPS) - In the 1960s, the Cuban government declared that storage of fresh water for times of drought or hurricanes was a matter of national security, and it began to dam up the country’s rivers. But that policy has claimed an unforeseen victim: mangroves. The sea swallowed up the old road connecting Batabanó and Mayabeque beaches, in southwest Cuba. In the last 50 years, more than 100 metres of coastline have been lost in that area to the south of Havana. The weakened mangroves, which now receive hardly any fresh water, were unable to prevent it from happening. “The mangroves deteriorated so much that in 2008, Hurricane Ike pushed the sea a metre and a half inland, and it never went back out. Since then, it has continued to advance inland,” Flora Yau, who lives in Surgidero de Batabanó, told IPS. People in this town in the municipality of Batabanó in the province of Mayabeque, some 70 km south of Havana, are tired of the flooding that now happens every time strong winds blow from the south. The worst thing is the loss of land to erosion. In some places, nearly two metres a year of coastline have been lost, and some areas are completely submerged now, like Bujamey Point. Mangroves, which make up 20 percent of the forests in this Caribbean island nation and cover 4.8 percent of the territory, need a constant flow of a mixture of fresh and saltwater, the researcher explained. Most rivers in Cuba have been dammed. There are a total of 969 reservoirs, according to the National Institute of Water Resources. This vast amount of fresh water stored up is due to a policy dating back to the 1960s, when the government decided it was necessary to confront droughts and hurricanes. “In some places, if we want the mangroves to thrive, we’ll have to give them a little water from the reservoirs,” said Menéndez. She said that was an indispensable measure for strengthening coastal forests, which act as barriers that protect life inland from natural disasters and other meteorological phenomena that are getting worse due to climate change, according to the scientific community. Besides the lack of fresh water, mangroves are under threat from the construction of channels and dikes, soil sealing, industrial pollution, and deforestation. CARIBBEAN: Final Throes for Jamaica’s ‘Hippie Paradise’? Four species of mangroves – red (Rhizophora mangle), black (Avicennia germinans), white (Laguncularia racemosa) and button (Conocarpus erectus) – have traditionally been used in Cuba to produce charcoal, railroad ties and tannin for curing leather. Mangroves play an essential role in all tropical areas of the Americas. The 11 species in the region are also threatened by tourism and the shrimp industry. Cuba‘s agriculture ministry prohibited the exploitation of mangroves in December 2012, as a measure aimed at adaptation to global warming. “Climate change has triggered an interest in preserving the mangroves,” said Menéndez. “Human beings need them to protect places where people live and economic activities take place,” at times of rising sea levels and salinity, and when extreme weather events occur. In a warming planet, the environmental services provided by the mangroves are becoming more and more crucial: they curb erosion of shorelines, provide breeding grounds for fish and other marine life, prevent saltwater intrusion into farmland and water sources, prevent flooding and preserve biodiversity. “If we cut the mangroves down, the sea advances with greater intensity,” geography teacher Miguel Díaz explains to his students in Batabanó. Teachers in the area, where communities like Surgidero de Batabanó are suffering the consequences, now educate their students about the problems facing the mangroves. Besides the loss of land, the soil on farmland near the coast is becoming more and more saline, and flooding is becoming routine. “When we go out to clean up garbage, we see that they steal sand for construction and cut down the trees, and other things are damaged too,” said Roxana Vitres, one of the 32 students from the Bac-Ly de Surgidero school involved in a programme in which students are taught about environmental issues. “We carry out inspections and alert the authorities,” said 15-year-old Daniel Cruz. The children and teenagers learn about ecology while cleaning up and monitoring parts of the coast, as part of the SOS Mangroves programme led by the Batabanó History Museum, the local partner of the non-governmental organisation Pronaturaleza and education authorities. 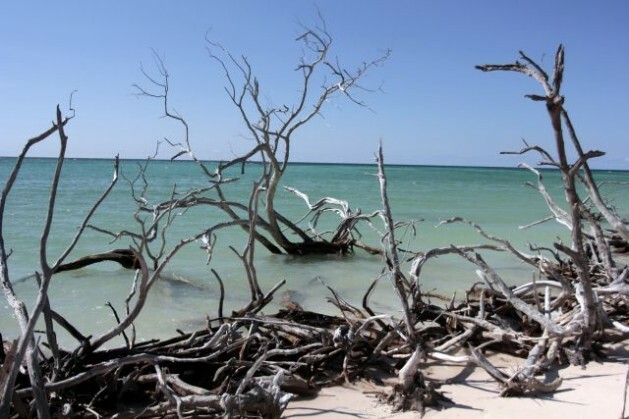 The dike, which began to be built in the 1980s, caused the death of the biggest and most productive forests along the coastline starting 130 km south of Havana – an area that includes Surgidero – according to a study by the state Institute of Ecology and Systematics. A large part of the mangroves in that area have been protected since last year because they form part of the South Batabanó Wildlife Refuge Area. But violations continue to be reported, because Cuba’s environmental oversight systems are weak and fines are small. Is this some kind of propaganda piece? Environmental Defense Fund has a different report on Cuba and its actions on Mangroves. So too does the National Geographic report increase planting of Mangroves. Must be some sort of distorted notion by Gusanos reporting on the Cubans since 1960? Catch up with some of the science.